Agni Link automates the transfer of Bills of Materials using an add-in to CAD/PDM/PLM applications by Autodesk, SOLIDWORKS, PTC (Creo, Windchill) and Siemens (Solid Edge, Teamcenter), just to name a few. It brings your data from both information silos into one common data object. You can easily define simple rules, so the discrepancies found between your systems are resolved in real-time automatically, based on simple rules that you can easily define. Easy, error-free, accurate and reliable. The Elmo way. And if you are not quite happy with the mappings and their behavior, you can easily edit them all by yourself — without any programming! Agni Link, the brainchild of Elmo Solutions’s R+D team, is the result of over 30 years of experience in the CAD, PDM and PLM domains. Our wizards have designed the link application with quality obsession. Our experts chose the most important feature that is often left out in the industry: the customer’s freedom of choice. 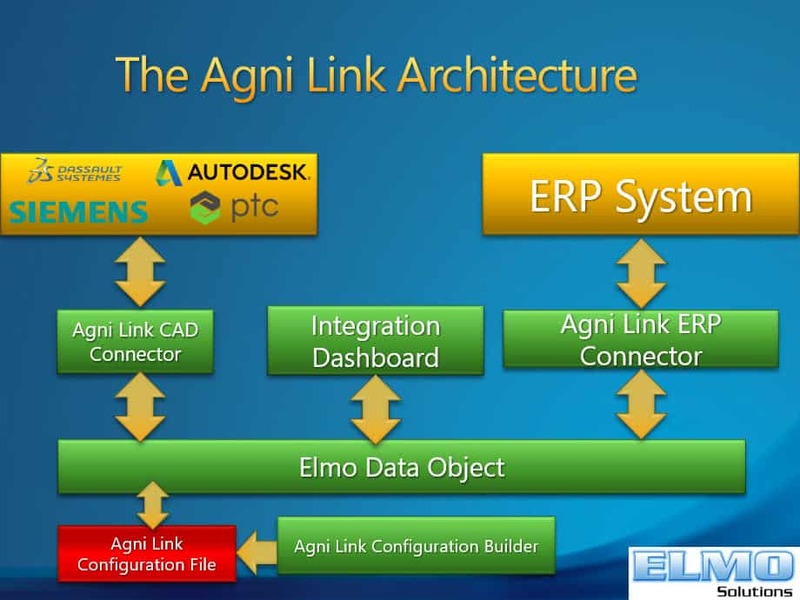 Agni Link is the most advanced CAD ERP integration system currently available. It’s an add-in to SOLIDWORKS, Autodesk, PTC or Siemens engineering applications. It offers a unique, reliable and cost-effective way to integrate CAD / PDM / PLM applications with virtually any ERP, MRP, BPM or other system. Vendor, Pricing, etc. : Users can see the procurement data from the ERP system (vendor information, costing, even available quantities). All in real-time! Quotes: Users can instantly switch from a product design integration to a quote integration… or any other type of integration, for that matter. The only limitation is your imagination! 1) Agni Link data object fetches all the mapped CAD / PDM / PLM and ERP data. 2) You define rules, and the bridge automatically resolves discrepancies found. Agni Link indicates decisions made automatically by through color-coding of data in the Agni Lnk Integration Dashboard. Of course, you can, at any time, either revert to the previous value, or select a different value of your own taste, as long as it is acceptable to the ERP system. If it is not, don’t worry, Agni Link will let you know right away! 3) The Agni Link Integration Dashboard presents the “merged” CAD and ERP integration data to the end-user. You can use it to display engineering data, but also ERP data such as any vendor, costing and availability. Users can use these informations to make better design decisions. They also use a color-coded dashboard that indicate any potential issues with the BoM data to be transferred. 4) Users can use edit functions to quickly validate and populate Bill of Materials data. Lookups performed in real time on the ERP system, ensuring that anything sent to the ERP has properly checked the ERP system’s own business logic. The results translate into much greater BoM accuracy. When Agni Link properly verified all data, it sent it back to CAD and ERP for the final synchronization. 5) End-User updates data simultaneously in both environments, upon final confirmation. He/she can even create automatic data (Items, Bills Materials, Routings, etc.) that does not exist yet in the ERP system. Not just about BoMs… Many different integrations are possible! Agni Link is a connector-based application that allows you to mix and match connectors to accommodate their CAD, PDM and PLM applications. A comprehensive set of connectors is currently available. You don’t see your current software in this list? Who knows? It might be already in the works, as the list of supported platforms is conatantly growing. Also, Agni Link’s architecture usually makes the configuring of a new connector a pretty straightforward process. Please contact us to discuss the possibilities. Agni Link have a three “buckets” architecture. Indeed, each contains the entire data the customer wishes to map. PLM PDM CAD data can be easily exchanged bidiretionally, in real-time, thanks to the Agni Link advanced architecture. Connectors for popular engineering applications from Dassault systèmes (SOLIDWORKD, SOLIDWORKS PDM, Catia, Enovia), Autodesk (AutoCAD, Autodesk Inventor, Autodesk Vault), Siemens (Solid edge, Teamcenter) and PTC (Windchill, Creo) can provide an easy, yet powerful integration with any ERP system. Agni Link can transform a lot of data. During the integration process, it processes mappings that can be not only constants, but expressions as well. Those can apply data transformations and calculations on data during the integration process. However, you can always have the last say on those. Actually, you may change them at any time until the final data transfer. You can do it the first time, or at any moment afterwards. Also, in the case of PDM and PLM systems, you can use selectable events like : new revision, new version, approval, release, etc. The Agni Link Integration Dashboard monitors the current state of the integration. Users have perfect control over the whole process, while automating the menial tasks. The Agni Link Integration Dashboard automatically creates/updates ERP Items, BoMs and Routings whenever necessary. Users rely on color-coding to indicate which new data objects will be created in the ERP system. 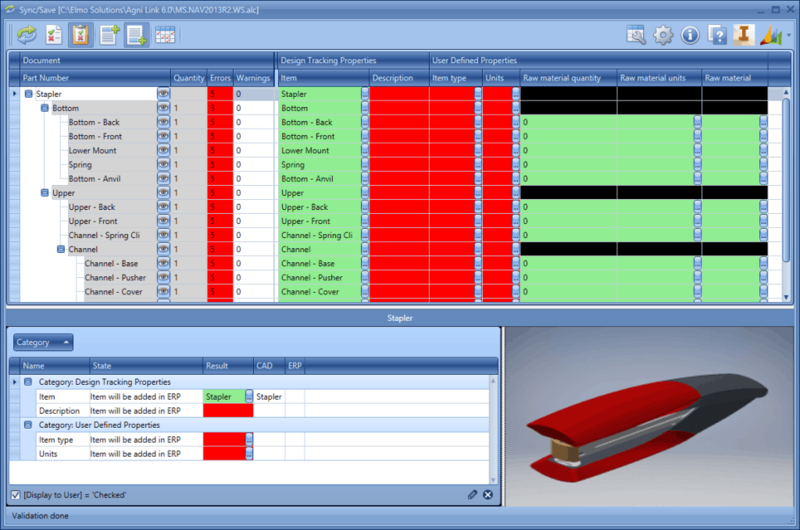 Also, the Dashboard simultaneously displays information for the entire Bill of Materials and specific component data. It makes extensive use of color-coding to indicate any issues or warnings prior to the actual integration. Users have total control over the integration process. The Agni Link Configuration Builder allows to create or modify an unlimited number of mappings, as well as the behavior of those mappings. The Agni Link Configuration Builder brings huge benefits. Its unique features give customers full control over their CAD and ERP integration… without any programming! This is not just about CAD… PDM and PLM are in the picture too! When the user set up specific milestones in your business process, your PDM system will automatically initiate synchronization. It’ll release the Engineering Bill of Materials data to the ERP system, thus updating product data in a timely fashion. You’re already in the PLM era? Agni Link can be your reliable companion. Our versatile application architecture will allow you to link procedures, user manuals, schematic, marketing, service, quality, support and many more, by merely changing the Agni Link configuration. Thus, Agni Link will allow bidirectional communication for all documents and files throughout the entire production/supply chain. That way, there won’t be an annoying « black box » effect for any stakeholders. Indeed, approval process will be distributed to prevent all discrepancies in real time. Also it’ll identify who made changes (and why). Your PLM efficiency is based on the coordination of product data. It includes : changes, status, configuration, document management and resources planing. For this kind of data, you imperatively need the best integration for your PDM/PLM and ERP data. Stop leaving money on the table, and INTEGRATE: the sooner, the better! You can interconnect all your software with a powerful, versatile and reliable bridge. To find out If you wonder how it could work with your particular system, don’t hesitate to contact us.